I LOVE to buy cute comforters and cute bedding sets for my bedroom! Cute Comforters Online is a website specially created for girly women and teenage girls! We love having a cute comforter or bedding set in our bedrooms! *On this site you will find all kinds of cute comforters and cute bedding sets imaginable! 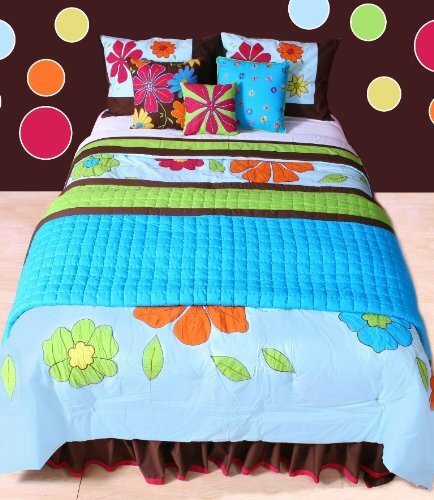 Just like this gorgeous and very ‘happy’ colorful flowers comforter set in this picture! 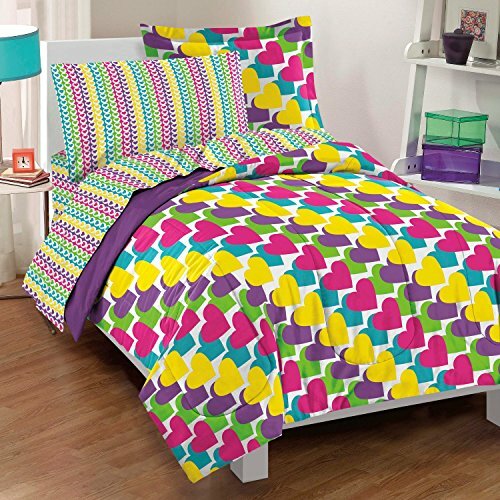 I think a cute and colorful ‘happy’ comforter has the power to make any bedroom look amazing! I personally love to switch my bedding set every two to three months, usually according to the season or my mood! It’s the fastest and cheapest way to change the look and ‘theme’ of a bedroom! I will be adding my top favorites on the right side column and I really hope you are able to find that special cute comforter set you were looking for! *All the cute comforters and bedding sets recommended on this website were selected based on my personal opinion and personal experience. How about having your very own ‘rainbow’ in your bedroom? Perfect for a teen or girly girl’s bedroom! *My favorite heart bedding sets! Have you ever seen a bearded dragon print duvet cover before? Check it out fellow lizard lovers! It is a bearded dragon photo print queen size duvet cover for sale! Wow! I took this picture of her a few months ago while she was watching the rain fall outside through our window. She is the sweetest bearded dragon ever! Since I also LOVE to find the cutest comforters and bedding sets online, I decided to create one myself! 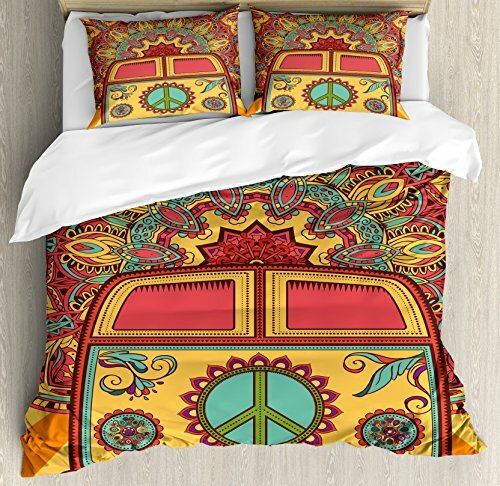 This gorgeous orange, red and blue hippie minivan peace sign design bedding set is one of my favorites! It will make your bedroom look gorgeous! The set includes the matching pillow shams. 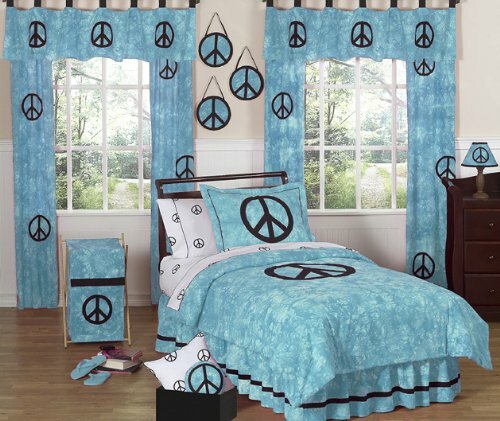 How groovy is this cute turquoise color peace sign comforter set for girls? I love this color and the fact that it is made of 100% cotton! You can also get the matching curtains, window valance and lamp shades to create a full groovy bedroom if you want! This cute and very colorful rainbow leopard print comforter set is also very popular among teen girls! They love leopard print stuff and mix that with rainbow colors and you have a winner! This is also one of the cheapest cute comforters online! One for my daughter’s bedroom and the other one I used it as a throw cover for my old couch! It’s a Rainbow Zebra Comforter! Now it’s time for a cute rainbow zebra comforter set! The combination of zebra print and rainbow colors is amazing! I also LOVE Cute Flower Print Quilts! What a cute flower print quilt! I love the huge flower prints on the turquoise background! This cute comforter is made of 100% cotton with a polyester fill, so it is very soft and delicate as well. Will make a wonderful gift to any girly girls in the family! Another super cute, pretty and girly comforter for your teen girl! 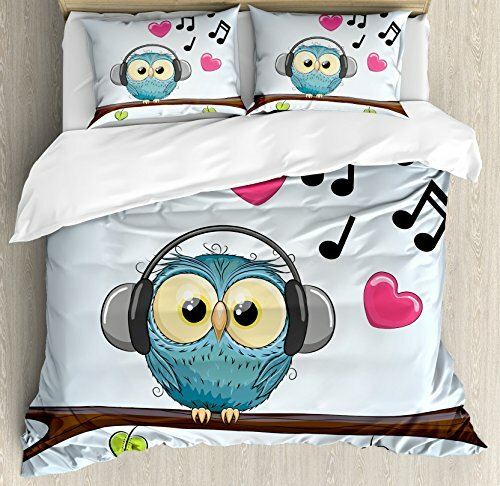 It’s a cute cartoon owl listening to music on a tree branch among cute hearts and music signs! Will immediately make your girl’s bedroom super fun! How do I find the prices & place an order? I’m looking for a quilt or comforter set with the Aurora Borealis or Northern Lights. Do you have this? Found the perfect comforter/bedspread on your website, but when I click on it, I get a different one. The one I love is 6 piece romantic red passion faux satin/sateen comforter/bedspread set. Is it available? And is it available in pink or purple? Hi Tracy, can you tell me what page were you on? Thank you!